What’s better than explaining this with some real life examples? We all struggle from time to time to get subscribers in our email lists. Whether we’re just starting and gathering our first 10 or 100 subscribers, and even if your blog is already receiving thousands of visitors, the conversion rate is usually low. But can you do something to get more subscribers? How many opt in forms do you have in your blog? If you don’t have 3 at least, you’re losing subscribers. Here at Stream SEO I used to have 1 form only on my sidebar (and it was in between many other widgets). After I started adding an opt in form at the end of each post, on my About Page and even at the top of my blog, I started getting A LOT more conversions. It’s not that we’re bombarding our readers with opt in boxes. Just select the right places and make sure those don’t overlap to make it easy for them to subscribe. Think about Social Media buttons that follow you to make easier for your readers to share or like something. My opt in box with Optin Skin pops up at the end of each post. At the top of the sidebar: or at the bottom of it (depends on your web design). Never put it at the middle between other widgets and banners. At the footer of your website: if they have scrolled all the way down, they probably want to subscribe. At the end of any post: Again, if they already scrolled down and read all your post, there’s a good chance they want to opt in. On your comments: Another way I’m capturing leads is by adding a check box in the comments to subscribe. Comments mean they’re already engaging with you, so, why not offer them to subscribe at the same time? The only opt in form I don’t like to use (and to see) but many people still use with good results is the pop up. The reason why I hate it is because it seems to be very aggressive and intrusive. Some people won’t let you read the content unless you opt in. But who knows. It might work for you. Derek Halpern from Social Triggers uses a featured box to create an opt in form at the top of the homepage to get tons of subscribers (just passed the 95,000 milestone). However, the key here is that he’s not only offering to become a subscriber, but actually tells you what you can expect to receive and why it matters. Very catchy opt in form, isn’t it? 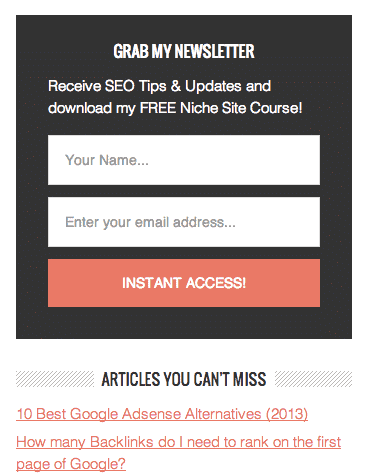 If I’m really interested on the niche, I’ll subscribe and it won’t be just another newsletter arriving to my inbox. Another easy way to increase conversions is to offer something extra or FREE in exchange. 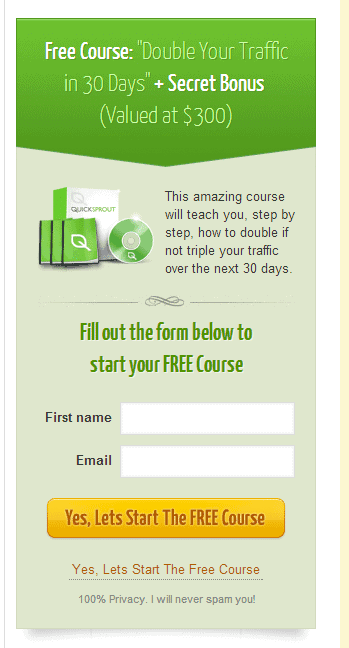 Neil Pateil from Quicksprout offers a FREE course to learn how to double your traffic in 30 days. He even includes a “secret bonus” and he’s adding a $300 value to its course. A FREE course valued at $300? I’m certainly in! You can offer an ebook or a guide to start something. Or you can even do a course by creating auto responders and sending them certain days of the week. If you’ve got an online store, you could offer an especial discount to your subscribers and then capture them to buy and receive updates from you whenever you want. I know you want to know your audience, and you want to be personal. If possible, I’d ask for name, email, city, age and more. But to be honest, this only hurts my blog because less people will feel comfortable. And we’re pretty lazy too. So make it simple and ask yourself what do you really need from your readers to subscribe? If you just need the email then don’t ask for more. I usually ask for the email and name (depending on which opt in form they subscribe from) and that’s all. Google recently anounced they’re discontinuing their RSS Reader service. I won’t make a discussion between RSS and autoresponders (this has been commented before) but if you’re just offering an RSS subscription you’re doing it wrong. If you don’t want to pay for a mailing service then you can always start with Mailchimp. You can send 6 emails per month and have a list up to 2,000 subscribers before they start charging for it. Just make sure you read the TOS before. They’re pretty strict about SPAM. Also, you’ll be able to contact your subscribers even when you don’t write a post. 6. You’re not using the right colors. If your blog’s background is totally white and your links and titles are blue, how can you get more conversions to your list? Many people think they should use a totally different color to make it stand out from the rest of the content, and there are a lot of theories and case studies where red or orange colors convert more. However, the reality is that you need to help your readers understand where they need to click or press the subscribe button. So, if your links are blue, then put a blue button to subscribe, not a red one. Try to use high contrast colors on your blog for this kind of actions and you’ll see more clicks (not only subscribers). I use an orange button which stands out form the rest of the box. Sometimes it’s that easy. If you have a great post and you want your readers to share it, then ask them to do so. You want them to subscribe? Sometimes it’s good to remember them they can easily subscribe via your opt in forms. You’d be surprised to know many of them haven’t seen those forms before because somehow they become invisible to their eyes. With Aweber, I can add a subscribe box to my comments. Do you ever write posts with several parts or experiments and case studies you can update? If not, then you should start now. The thing here is that sometimes you don’t need to write all the post and results. Keep some secrets and bonuses with yourself and release them to your subscribers as a premium. For example, in my Website Speed experiment, I ask my readers to subscribe to my blog so they can receive updates every week on how I’m doing with my rankings. Many people felt that was an easy way to remember even if they didn’t bookmarked my post or came back later, so it worked. A/B tests mean you use different positions, colors, forms and evaluate them to see which ones are receiving more clicks. One way you can easily to this is using the Optin Skin plugin and the Viper Bar, but if you can’t, at least put a tracking code on each form so that you know where your subscribers are engaging. Then you can try one month with the opt in box at the top of the sidebar and another at the bottom and measure results. There are infinite ways to do A/B tests, and you should always do them to enhance your opt in rate. If you have another tip to increase your email subscribers list or if you have done tests and discovered one thing works better than other, please leave a comment below. I’ll be very happy to share it with my audience and give you credit back. I am not getting any email subscribers at all, so that’s one of the challenges that I will have to solve in the future (although the main one is getting the time to actually write posts). 🙂 You write that you don’t like pop-ups, however I have seen them on many sites. You go on the site, start reading an article and then you see a subscription form pop up. Sometimes you get it straight away, sometimes after some time. Are there any statistics on how many people actually sign up and how many are scared away? Or after what time is it optimal for the pop up to appear? Also any good plug-ins? I have seen several pop-up plugins for wordpress.org, but not sure which ones are the best. I don’t think the theme that I bought allows me to place subscriber boxes at for example the end of articles, so maybe a pop up would be a good option to get subscribers, since the only subscribers I have are still from the time that I had a free wordpress.com blog and no new ones since then. Yeah, I don’t like pop ups as they seem to be very intrusive, but I can’t neglect that they usually work. There are statistics and most people say pop ups didn’t affect in their traffic at all, but it helped get subscribers. It’s up to you and your audience but I have heard that most of the times pop ups don’t hurt. It’s just I like cleaner websites. Some good plugins can be optin skin or even hybrid connect. Free plugins from the WP repository won’t cut it, honestly. Click on any of them to check them out. 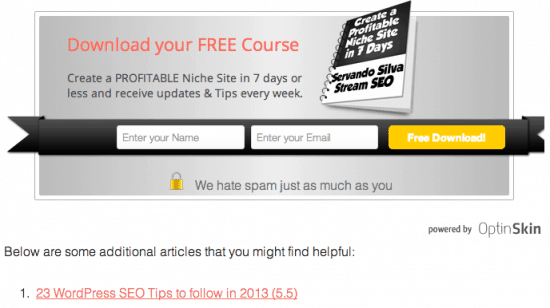 This is an awesome article about ways to get more email subscribers. I took your advice and I now have my list’s sign up form in three places on my blog and I put the sidebar’s sign up form up at the top, directly under the search box. I also plan to offer a free ebook in exchange for email subscriptions as soon as I am done writing it. Thanks for the advice, Servando! Let me know how it goes with your results after a few weeks. Awesome tips, Servando. I agree with all of the points you mentioned. I think that one of the biggest reason most blogs don’t get as many subscribers as they should is because they don;’t have the option form above the fold and don'[t have a good call to action. You have to compel your reader to want to subscribe and just saying “Get Free Updates” ain’t gonna cut it. Also, the blog viper bar is wonderful too! it is great for squeezing even more subscribers from your traffic. Thanks for sharing your tips and insights with us. I’m glad to have found your post on BizSugar.com. I hope to see more of your content there soon. Thanks for the compliments. Yes, there’s a lot more than the “Free updates” phrase. However, I still use it at least in 1 of my forms because I have hears from some of my readers that they’re just looking to subscribe to my RSS updates without wanting to download any guides or anything else. I like the Viper Bar and Hello Bar, but I use them at times. Usually 1 month or so and then take it off because it tends to become invisible to my readers. Then I upload a new one later. BTW, I’m glad you’re here. I know your blog and it’s a coincidence that the same post you’re linking on commentluv is the one I first read from you a few months ago. These are lovely points! Thanks for the share. Optin skin is great, but if you’re in a budget you can still add opt in forms with different methods and pure HTML/CSS. Great points and reasons mentioned! Really liked your article and points you have presented as effective reasons. Helpful posts, thanks for sharing. Glad you liked it Frampton. Let me know if these techniques work for you.